White oak tree limbs (Quercus alba); photo by Carmen (thespanishpeach) on Flickr (noncommercial use permitted with attribution / no derivative works). 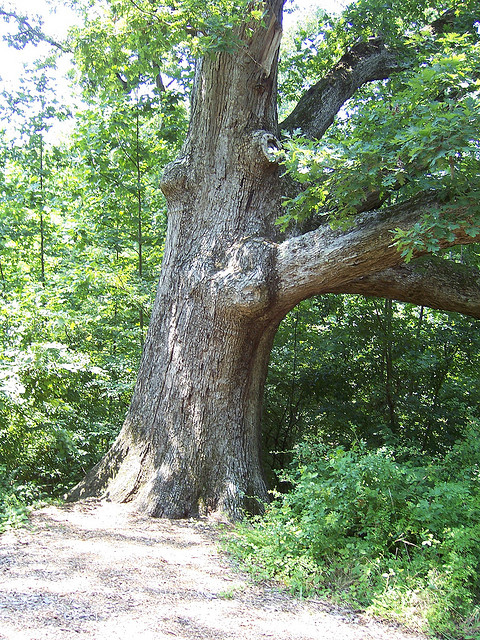 Found commonly throughout Maryland, white oaks are large, slow-growing, and long-lived trees (some are known to have lived for over 600 years). Native to eastern North America, white oak trees reach heights of 60 to 150 feet, with trunk diameters between 3 to 4 feet. Their glossy, bright green leaves have rounded lobes (five to seven per leaf). 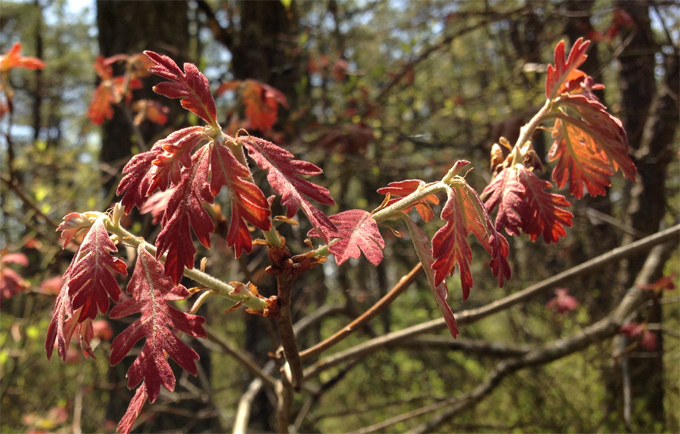 In spring, new leaves display a pink color for about one week before turning to green. 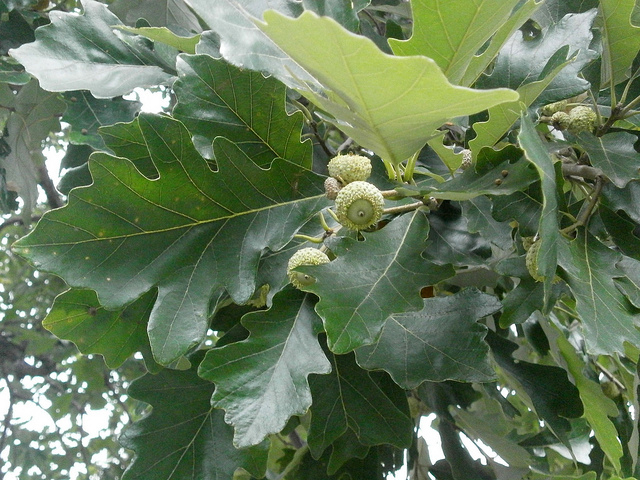 At about 50 years of age, a white oak tree begins to produce acorns and may produce 10,000 annually. These acorns are sweet to the taste and they are a dietary mainstay for over 80 species of birds and mammals. Native Americans ground acorns into flour, as did early European settlers. 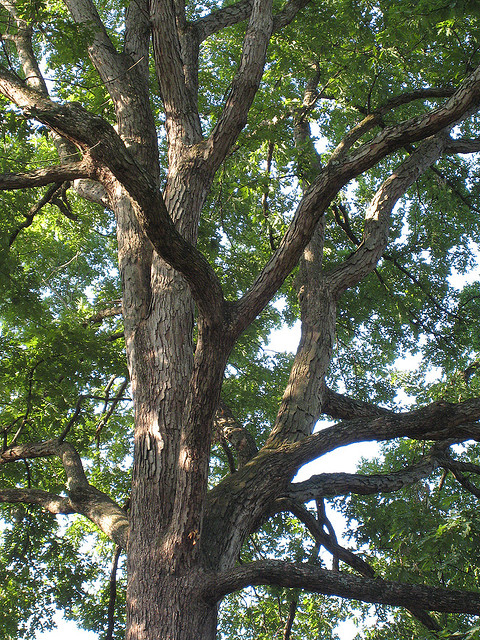 It is very unusual to find a white oak tree with white bark; the usual color is an ashen to dark gray. White oaks produce durable and beautiful hardwood lumber with a fine, almost watertight grain. White oak (Quercus alba) - new leaves are pink: photo by Famartin on Wikipedia; use permitted with attribution / share alike (CC BY-SA 3.0). White oak tree (Quercus alba) leaves and acorns ; photo by Multivac42 on Flickr (noncommercial use permitted with attribution / no derivative works). White oak trunk (Quercus alba); photo by Phillip Merritt on Flickr (noncommercial use permitted with attribution / share alike).